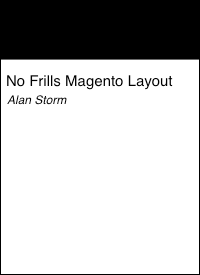 This entry is part 9 of 13 in the series Magento 2 UI Components. Earlier posts include Magento 2: Introducing UI Components, Magento 2: Simplest UI Component, Magento 2: Simplest UI Knockout Component, Magento 2: Simplest XSD Valid UI Component, Magento 2: ES6 Template Literals, Magento 2: uiClass Data Features, Magento 2: UI Component Data Sources, and Magento 2: UI Component Retrospective. Later posts include Magento 2: uiElement Features and Checkout Application, Magento 2: Remaining uiElement Defaults, Magento 2: Knockout.js Template Primer, and Magento 2 UI Component Code Generation. After last time’s observables primer, we’re ready to jump back into some related features of the UI Component system and uiElement based objects. We’re going to start with a common pattern Magento uses with uiElement derived objects. First, let’s create a uiElement derived object. This is pretty standard observable stuff. If a Knockout template accesses the title value via a data-binding, any later call to our observable’s “setter” will trigger a UI re-render. 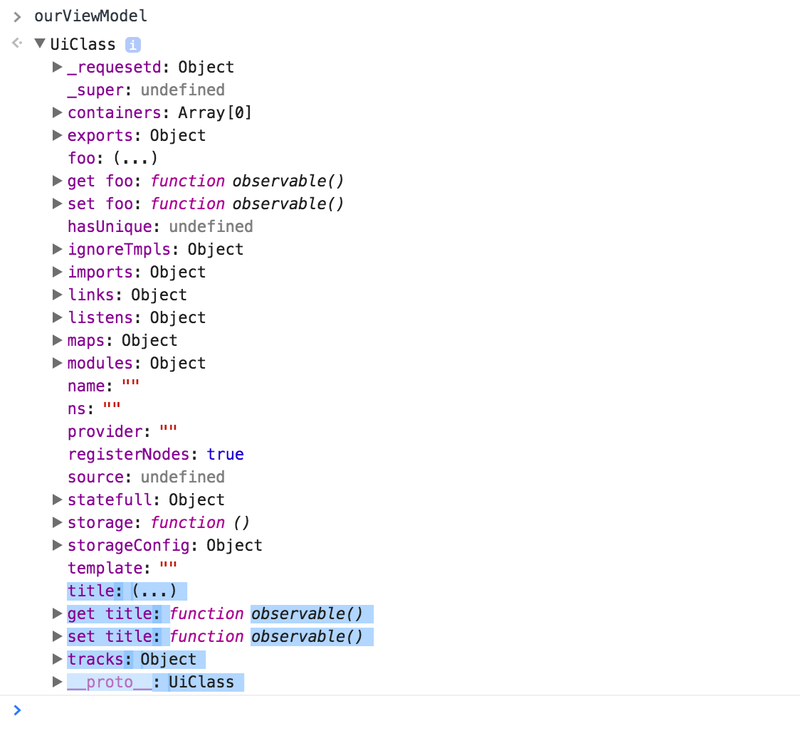 Magento’s uiElement derived objects (including the important uiComponent and uiCollection constructor functions) make heavy use of ko.observables as data properties. This makes sense, as these objects are the view models Magento’s custom scope binding uses to access data from template. Magento is so fond of observables, that there’s some extra observables features baked into uiElement derived objects. displayed on your screen. The on method is a special event handling method that every uiElement has (and comes from the Magento_Ui/js/lib/core/events module). As in “on this event (the first argument), call this function (the second argument)”. If you run the above program, you should see your callback function (from ourViewModel.on) called. you’ll see we’re using a regular assignment instead of calling an observable function. The tracks default is a neat, and powerful, feature. Once the novelty wears off, you may be left wondering how this even works. To talk about the tracks feature, we’ll need to talk about Steve Sanderson’s knockout-es5 plugin. The knockout-es5 plugin adds support for ECMAScript 5 properties. Magento includes the knockout-es5 plug as part of its front end enviornment. This plugin adds a ko.track function that lets you track properties on an object without setting up observables for each property. Or, to be more accurate, without manually setup observers. When you call track, the plugin will automatically create observables for the object’s properties, and swap these observables in as ES5 setters and getters. The theory is this offers a cleaner syntax than the sometimes awkward observable objects. Behind the scenes, the uiElement‘s tracks feature uses knockout-es5 to implement its tracking. If you take a look at our object in a debugger, we’ll see that title has both a setter, and a getter, and that these are an observable function/object. Update: This article previously contained a warning against directly using the track function that powers the tracks default. This warning was off-base. The problem I was seeing with track was not a bug in the uiElement object, but my being forgetful about observables only firing when a value changes. i.e. So, rather than a cautionary tale about systems level APIs being public, instead this should serve as a warning about the difficulties in trusting an undocumented system. Tracked Variables are Observables. Mostly. Also, in case it’s not obvious, if you data-bind (via Knockout.js) a DOM node to a tracked variable, Knockout.js will treat the DOM node as an observable and re-render your UI whenever the variable is updated.